When the rest of the sneaker community heads out to purchase the "Black Metallic" Air Jordan Retro 5 on August 6th, girls will have the option of also picking up this new colorway exclusive to them. When the rest of the sneaker community heads out to purchase the "Black Metallic" Air Jordan Retro 5 on August 6th, girls will have the option of also picking up this new colorway exclusive to them. 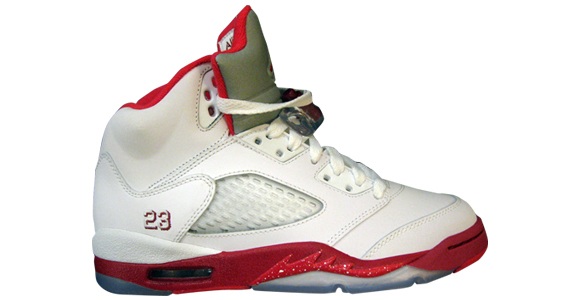 Sporting a fairly simple look, the shoe features a white leather upper with red accenting Jumpman branding, the inner liner, "23" embroidery border and midsole. Finishing things up below is a blue-tinted translucent outsole. Available sizes will range from infant to gradeschool.